This week’s article is going to be a bit on the technical side. I currently received dozens of comments every day via the blog or through the Everyday Linux User email account. Many of the questions I receive are directed towards dual booting Windows 10 and either Ubuntu or Linux Mint. I have written a number of guides showing how to dual boot Ubuntu with Windows 10 and Linux Mint with Windows 10. Whilst the majority of people are able to follow the guides and get the desired outcome there are many people who come across issues. The reason that some people have instant success and others have problems is down to a couple of factors. The first issue would be the hardware that is used to install Ubuntu or Linux Mint. Each hardware manufacturer has a different implementation of UEFI and with all the will in the world I haven’t got the capacity to try each and every combination of them. (Unless hardware companies want to sponsor me to do so of course in which case feel free to get in touch). The second issue is to do with the way Windows was installed on the system in the first place. Sometimes a user will install Windows in UEFI mode and Ubuntu in Legacy mode. This is not best practice. 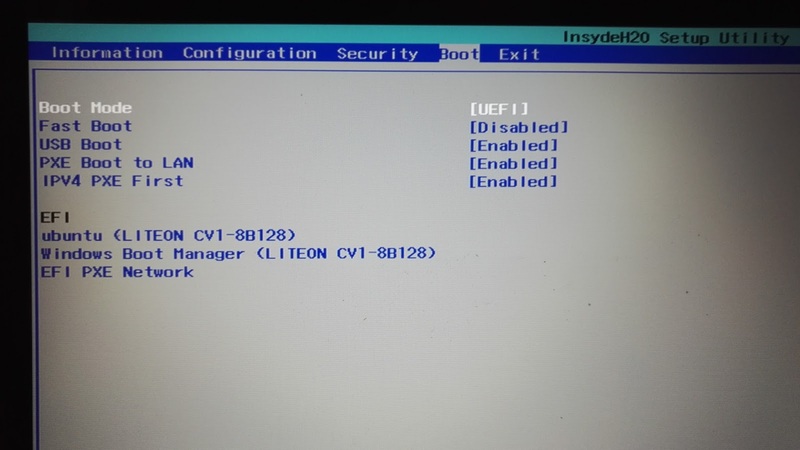 Other people have the issue whereby they have upgraded from Windows 7 to Windows 10 and whilst their machines have UEFI available, Windows was initially installed in BIOS mode and therefore installing Ubuntu in UEFI mode makes it hard for Windows to see Ubuntu and for Ubuntu to see Windows. The general outcome of all this is that users either don’t see the install alongside Windows option or they reboot to find that there is no GRUB menu for choosing between Ubuntu and Windows. In this guide I am going to provide some information about getting into the UEFI settings screens as well as making suggestions as to how you might fix issues with dual booting. 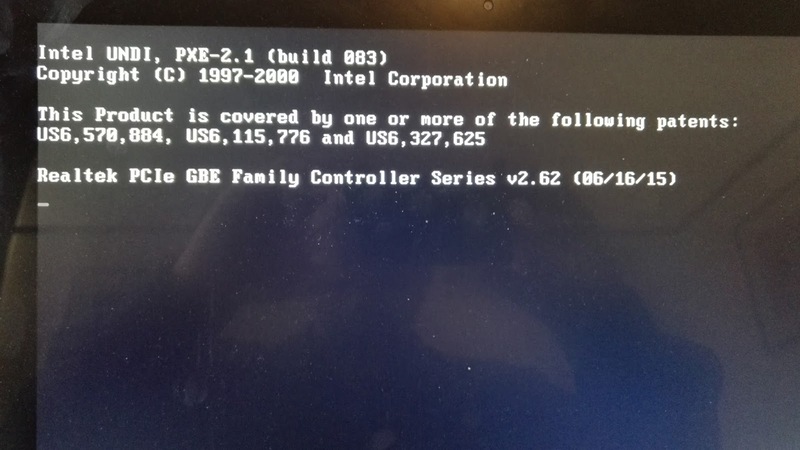 As much as I like to use tools like EFI Boot Manager, BCDEdit or Yannus Boot Recovery tool to fix boot issues sometimes it is just easier to go straight to the systems own settings screen and fix it from there. So you have installed Ubuntu alongside Windows and you think you have done everything correctly but when you reboot your computer it goes straight into Windows. 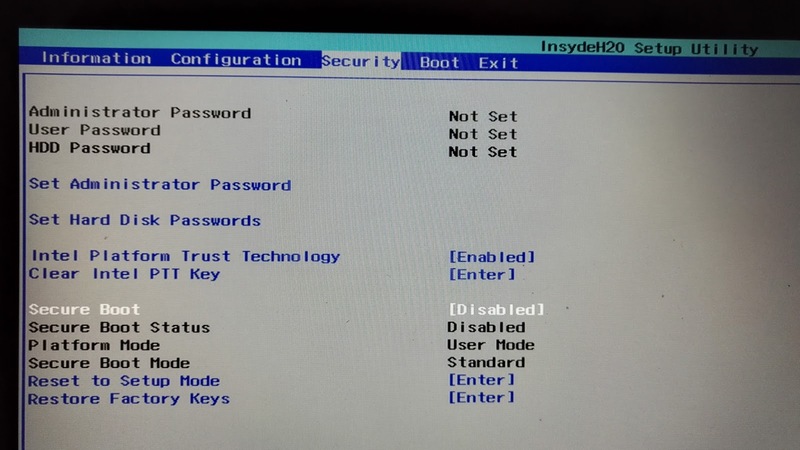 On a Lenovo machine you can actually press a function key to bring up the boot manager which lets you select a boot option. As you can see from the screen shot above, I have options for Ubuntu, Windows and network booting. If I were to insert a USB drive or DVD both of these would come up as options as well. 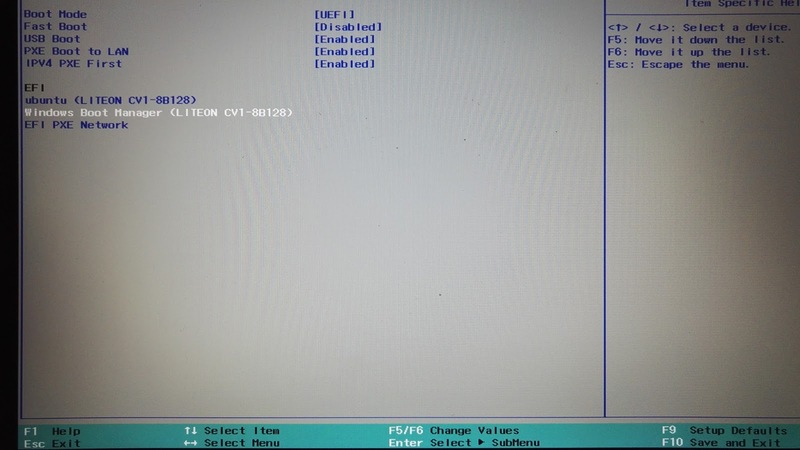 The key to press on a Lenovo to bring up the boot manager is F12. This site has a list of function keys to use for other manufacturers. It is worth trying the boot manager option to see if Ubuntu (or any other version of Linux) shows up. If it does try booting it to make sure it works. If you are happy to use the boot manager to pick the operating system you wish to use then just remember the key and press it on each launch. Most people however will want to fix the boot order so that it works correctly. What I will show now will help those people who have installed Ubuntu and can’t get it to show up and it will also help people who can’t get the USB drive to boot. To get into the UEFI settings screen press the relevant key on the keyboard. So what are the keys? On my Lenovo the key for accessing UEFI settings is F2. The site linked earlier in the article also shows the keys you need to press to get into the UEFI settings for most manufacturers. Isn’t all this annoying? Why can’t all the manufacturers come up with a standard key. Some manufacturers can’t even use the same key across all of their models. What you will see when you get into the UEFI settings screen is something akin to the screenshot above. Now the screens I will you won’t be the same across all systems and so I am going to show you what to look for but the options may be in slightly different places and on some systems won’t be there at all. The important screens are Security and Boot. It is worth noting though that on my configuration screen you will see that Wireless LAN is enabled. If for some reason WIFI isn’t working on your computer it is possibly worth looking in your UEFI settings screen to see if it is disabled. To change a setting simply press the enter key on the option and it will either show another menu or toggle the state. (i.e from enabled to disabled). The above screen shows my security settings. There is one setting on this screen which you should think about changing if your USB drive will not boot into Linux and that is “Secure Boot”. Toggle the secure boot from enabled to disabled. Most of the major Linux distributions are setup to work with secure boot enabled but not all of them. The boot screen is where the real action happens and there is a lot to talk about here. First of all if you are struggling to get your USB drive to boot into Linux check the setting of the “Fast Boot” option. Set the value to disabled. In addition to this check to see if there is a “USB Boot” option. Not all computers will have this in the settings and you can pretty much assume if they don’t then your computer will be set up to boot from USB. If there is a “USB Boot” option change the setting so that it is enabled. I will deal with the UEFI options first. Again if I had a USB drive plugged in or the DVD drive plugged in these would show up as well. By default my computer is set to boot from Ubuntu first and that is why on my computer I get the GRUB boot screen first. Windows is set to boot only if Ubuntu can’t boot. If on your screen Windows Boot Manager is first and Ubuntu is second, select the Ubuntu option and press the relevant function key to move it up the list so that it is ahead of Windows. You should move your USB drive ahead of Windows as well as it will allow you to boot from the USB drive without messing around. If you look at the bottom of the screenshot above you will see F5/F6 is equal to “Change Values”. If I press F5 the option moves up the list and if I press F6 the option moves down the list. If you have installed Ubuntu alongside Windows and you see both options on this screen then this is the most likely reason your computer boots straight to Windows. If you don’t see Ubuntu on this screen then the next option comes into play. It is highly likely you installed Ubuntu in legacy mode. 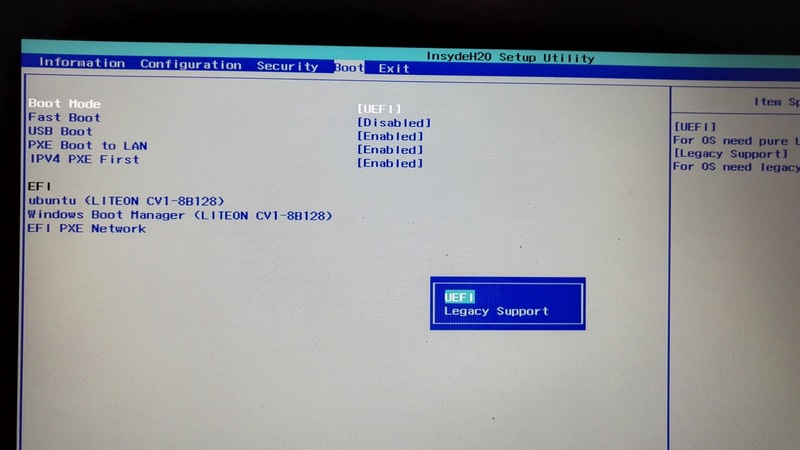 To switch to legacy mode click on the boot mode option (which is currently set to UEFI) and then choose another option. In my case it shows “Legacy Support”. On other machines it will simply say “Legacy”. The legacy mode settings differ from machine to machine. For example on this Lenovo if it can’t boot from legacy mode it will switch to UEFI, although it is quite a slow process. On other machines like my Dell it tries to boot into legacy mode and if it can’t it just gives up. If you switch to legacy mode and your installed version of Ubuntu suddenly boots then you know you have installed Ubuntu into legacy mode. How do you fix this? Personally I wouldn’t even attempt to. I would wipe the partition you created for Ubuntu, make sure the UEFI settings are firmly set to UEFI and run through my installation guide again. It is highly likely that if you have installed Ubuntu in legacy mode then the option to boot into Windows doesn’t appear in the GRUB menu. There is of course another scenario whereby Windows was installed in legacy mode but Ubuntu was installed in UEFI mode. If this is the case then when you enter the UEFI settings you will only see Ubuntu as an EFI boot option and not Windows. Switching back to legacy mode will give you the option to boot back into Windows. How do you fix this? There are 2 ways. You could install Ubuntu in legacy mode as well as a dual boot to Windows or you could re-install Windows in UEFI mode and then reinstall Ubuntu in UEFI mode as well. The whole UEFI settings thing has become a bit of a minefield but hopefully this has put you in the right direction when it comes to dual booting. Going forward I think it would be beneficial for hardware manufacturers to standardise on function keys. It might be worth them dropping the legacy support options as well as the major Linux distributions are able to boot via UEFI. All other distributions just need to catch up now. UEFI is not a new thing anymore. I downloaded the latest version of Point Linux yesterday and found that it only booted in Legacy mode and the kernel was down at 3.16. Great perhaps for older machines but not for anything released in the past 3 to 4 years. I'd never had a UEFI computer, so ended up installing Ubuntu in Legacy mode… and wiping and reinstalling in UEFI mode, just as you suggest. Sure, a little more reading would have helped, but I've installed linux so many times over almost 20 years that I figured I knew what I was doing! You noted in your article, "It is worth noting though that on my configuration screen you will see that Wireless LAN is enabled. If for some reason WIFI isn't working on your computer it is possibly worth looking in your UEFI settings screen to see if it is disabled." This interests me because at present, I only get wifi on Ubuntu when I boot my Dell xps 13 with secure boot disabled. Is this fixable through the Windows Boot Manager? If so, how? "GRUB-installation /dev/sda failed". I figured out my EFI partition is "read only" but I dont know how to fix it. This problem is with almost all HP laptops. I would request you to consider this problem and tell all the HP users a fix. I have an acer aspire xc 704g and it seems to install ubuntu ok, but when I reboot, the partition doesn't appear on boot. Further, when going back into live ubuntu, efibootmgr shows that the changes I made on install disappeared. I tried this UEFI tutorial and it didn't help either. Any ideas? The option to trust the drive doesn't come up in bios as well. I have a dell inspiron 5000 series laptop. 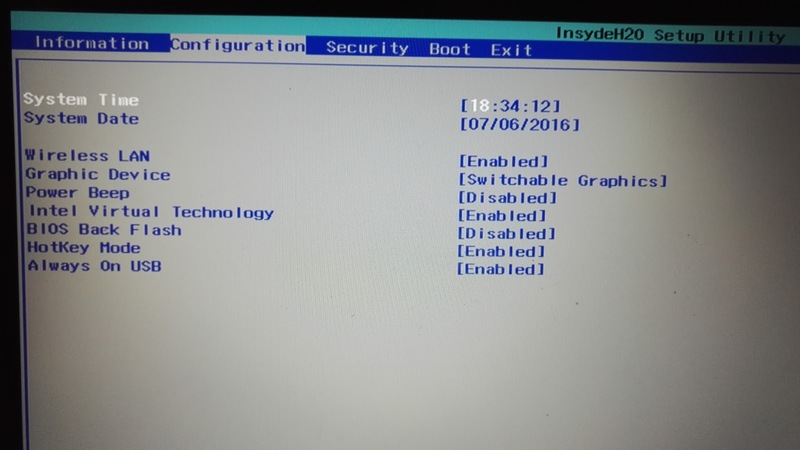 Inthis how can I set duel os ( windows 10 -64 bit along with Ubuntu 14.04) in UEFI Boot? Hi, Thanks a lot for this and other tutorials. Really helped me. I have the ideapad y700 same as you and installed ubuntu 16.04 alongside windows 10. I think I installed it in legacy mode and as you rightly pointed out, windows doesn't appear in the boot menu. How do I boot to windows? You don't. You follow the instructions and reinstall in UEFI mode.